It’s a delightfully down-to-earth approach, fitting for a film that feels grounded in a near-universal reality; a complex relationship between a high school senior and her mother. 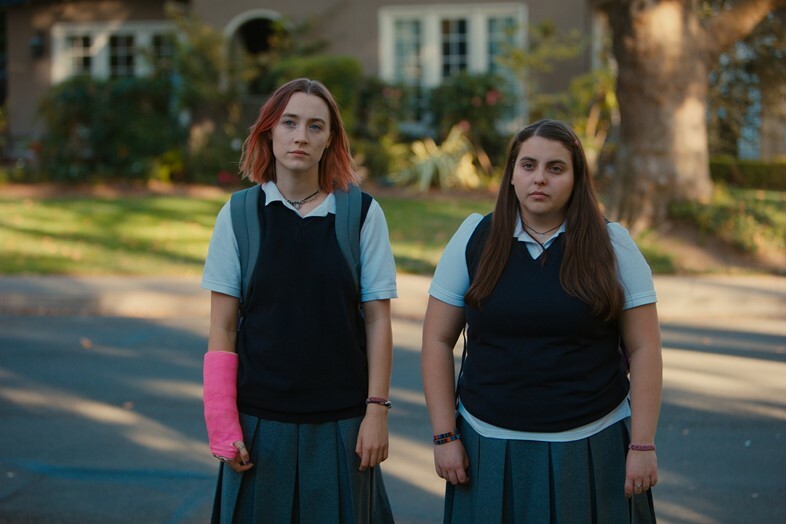 Lady Bird tells the story of Christine ‘Lady Bird’ McPherson, a Sacramento teen whose dreams of attending college on the East Coast are thrown into jeopardy by her parents’ financial situation (and her own fairly average grades). Though the plot sounds simple, Gerwig leads her main character across vivid emotional stepping-stones; a deeply satisfying narrative arc that steers Saoirse Ronan’s Christine from teenage self-absorption to awareness, gratitude and self-actualisation. It’s a journey that required around 96 costume changes. Gerwig’s reference points for the mood of the film were diverse, too, encompassing paintings by Wayne Thiebaud, the work of Joan Didion and the Marx Brothers’ movie Duck Soup. She also gave her team personal photos and journals from her own high-school years. It’s especially in details like these that the costume design excels, bringing a kind of visceral nostalgia that feels authentic rather than saccharine. Laurie Metcalf, who play’s Lady Bird’s well-intentioned mother, but who nevertheless knuckles up against her daughter’s strong-willed ways, was dressed with a similarly attentive eye. “In [Metcalf’s] outfits we used some patterns and necklaces that are kind of loud, to give another layer of possibility. Who was Laurie before she started carrying the weight of supporting a family? It was really important to Greta that we give a back story to her, to know that she has a personality and hopes, desires and dreams underneath all that, too.” The tie-dyes and statement pieces Metcalf’s character wears when she’s off-duty contrast with her drab nurses scrubs. They hint at an inner life and ambition that – were she only to look a little closer – Lady Bird might recognise as similar to her own. Napier came to costume design somewhat serendipitously. Finishing up an MFA in Art in Illinois, unsure of what to do next, the California native received a call from a friend. “She was like ‘why don’t you come to LA and be a stylist?’ I said, ‘what is that?’” The friend told Napier: “you go to thrift stores all day long and you make people in bands look cool”. April was sold, and soon found herself working in music videos, dressing artists like Nine Inch Nails, Macy Gray, Lenny Kravitz and Radiohead. She’s carried this same openness throughout her career, leaving room for opportunity to find her. Paraphrasing a quote that resonates with her (“I think it was Truffaut”), she advises always leaving space for something – fate, kismet – to come in and surprise you, “because that’s where the magic happens”. For her time on the Lady Bird set, this meant looking to their surroundings. When the crew began to prepare for the scenes of Lady Bird’s high school musical (a rendition of the Sondheim flop, Merrily We Roll Along), Napier and her team raided the costume cupboard of the school they were filming in.